Inside Monteliscai castle three apartments have been installed recently respecting all its historical content. hall, kitchen, garret, one double-bedroom and 2 triple bed-rooms all with bathroom and TV inside each one. Availability to rent also each separately bed-room. 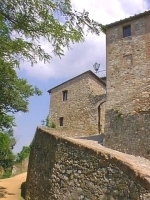 This old castle belongs to the Sienese Republic and was founded in ancient time. We can find it in historical documents dealing with the parish church events since 1101, when the priest of the parish in S. Pietro in Monteliscai offered its patronage to the Camaldolese Abbey in Badia a Ruoti. "We can say that... it should surely have been a very strong place due to its position and, according to the fortress types of that period, the weapons form and tha way of fighting..."
"In spite of its strong, high position, nearly unaccessible by enemies since set up in the very high mountain peak, all over surrounded by precipices and crags, it gave up, since temporary, to the strong soldiers of Florence Republic on 19 September 1229." In 1479 it was also damaged by Florence soldiers during the war when they had been defeated by Sienese and Aragonese alliance.